Moroccans take part in a demonstration against official abuses and corruption in the town of Al-Hoceima, Morocco early June 3, 2017. Picture by YOUSSEF BOUDLAL/Reuters/PA Images. All rights reservedThe protests began on the night of Mohsin Fikri's death, and soon turned into a popular movement. Mohsin Fikri, was a fish seller killed in a garbage container by the authorities on October 28, 2016. This incident was the first spark for a wide popular movement, in which various segments of society have participated. The movement has and continues to call for peaceful protest. After authorities confiscated his goods and threw them into the garbage truck, the fish seller climbed into the truck to retrieve it where he was crushed without mercy as a video that circulated online shows. Immediately after, the hashtag #Than_Mo (crush him!) was widely used on social media, referring to what the policeman in the video says as he orders the garbage truck to crush the fish seller. Those involved were sentenced to only 8 months in prison in a case in which a citizen was brutally killed by the authorities. This verdict was deemed unfair by a large segments of the Moroccan public opinion. The incident of the fish seller exposed corruption in the country and increased the pressure already present in the region. Al Hoceima, and the Rif in general suffer from marginalization at various levels. This made the demands for an end to the marginalization of the region find immediate resonance among the public. With time Nasser Zafzafi emerged as a symbol of the movement. Zafzafi along with some of the victim’s friends, had gone to the local governors house at midnight demanding an immediate investigation into the murder. The peaceful popular movement in Al Hoceima and its surroundings repeated the slogan: freedom, dignity, and social justice. 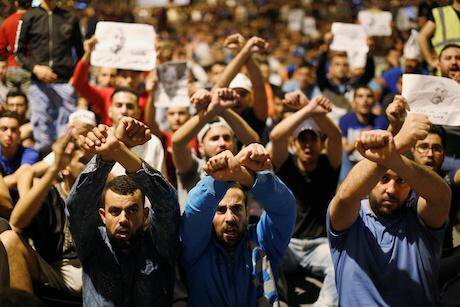 However, the current Moroccan government, formed in April, was not responding to the calls from the streets. A committee from the popular movement drafted demands that include a number of legitimate social and economic demands needed in the region, such as health care, education and the completion of already promised projects. However, these demands are yet to be met with the government still negotiating. The protests were met with repression. Since the beginning, a number of activists have been arrested. Protests were to take place during the month of Ramadan. On the 26th of May, a day before the start of Ramadan, sermons were read in the mosques in Al-Hoceima city calling for a halt of the protests saying that these would constitute an act of sedition. These sermons provoked the Nasser Zafzafi to confront the speaker and this move prompted the authorities to issue an arrest warrant against him. Soon after, he was joined by a group of activists such as Mohammad Al Asrihi, who was covering the news of the movement on the news website Rif24 and Salima Al Zayani who was the only woman in the popular movement committee since its beginning in November 2016. Some of the detainees were taken to the city of Casablanca and held at the Okasha prison while other were kept in the local prison in Al Hoceima. The arrests of the activists increased the tension on the streets. People would go out to the streets on a daily basis after Iftar to remind the authorities that they are not giving up on their demands, and adding two new ones: an end to the militarization of the region and the release of all detainees. The arrests of the activists were followed by arbitrary arrests and the use of violence to disperse the protests. On Eid al-Fitr, June 26th, the families of the detainees were joined by large numbers of residents of Al-Hoceima, despite the security cordon around the city and the authorities banning residents from the environs to enter the city. They went out to protest the unusual situation in the region: the intensive military presence and political arrests which increased and exacerbated the situation. The authorities responded with violence, beating protesters, banning transmissions and arresting anyone trying to document the violence, and an excessive use of tear gas. The number of detainees reached 150, some of them were released later. Before the arrest of the activists, a million people’s march was planned on 20 July, a symbolic date commemorating the battle of Anoual, when Ben Abdelkrim Al-Khattabi won against the Spanish army in 1921. People were adamant on making the march happen despite the repression they faced two days before the organization, and the prevention of people from entering Al-Hoceima to participate in the march. However, despite all the obstacles some solidarity activists were able to come to Al-Hoceima to participate alongside residents. However, the plans changed because of the repression, and the march dispersed into several protest points distributed over the neighborhoods of the city. Tear gas was used, protesters were beaten, and more than 200 people were arrested. The violence resulted in a 20 year old man entering into a coma. He is now in a military hospital in the capital Rabat still in a critical condition.